Khubz Mahala is one of many kinds of beautiful bread from Iran. I thought of it today as I read story after story of people denied entry to the USA to visit friends and family or rejoin lives that they established, peacefully and legally, sometimes years ago, to share the American dream of a better life. Not being American or even in the US on holiday, there is nothing I can do except protest in print and send thoughts and sympathy to people who have become aliens in their own land. That includes the millions of Americans who are disbelieving and angry in turns, going through the first stages of grief, as this new President and his cronies behave, and seem to get away with behaving, like dictators rather than elected representatives of the people in a functioning democracy with a strong legal system. Do you have neighbours or friends who are connected to countries on Trump's banned list? Are they trapped? Can you water their plants or rescue their dogs from the kennel or fetch their cars from the airport car park? Are their families trapped by waiting for them to come home? Can you do their laundry? Drive their kids to school? Cook them something soothing? How can you show practical support? Here is a recipe for Khubz Mahala, a gorgeous type of bun from Iran. It's easy to make and maybe it will make someone happy. This is the first in a series of recipes for Banned Buns. 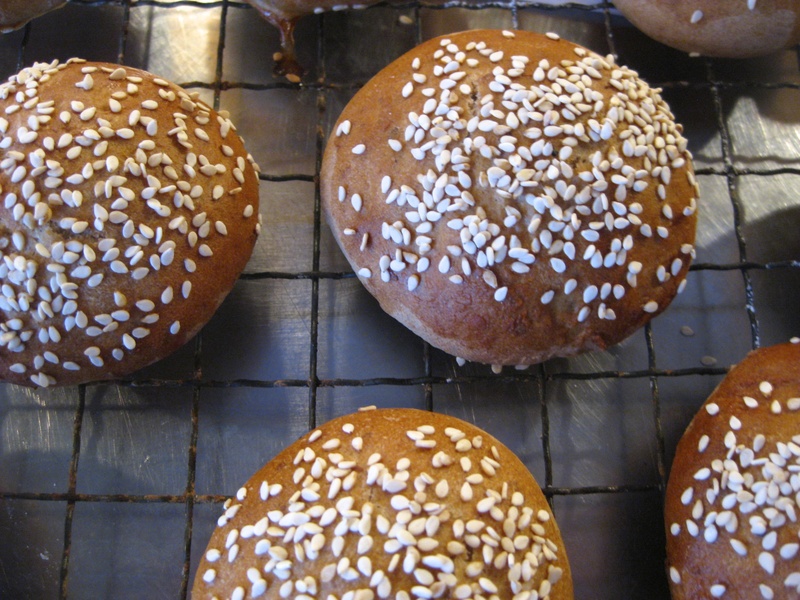 Bake a banned bun today and give it to someone who needs your help. 1. Put the dates in a small saucepan and just cover them with water. Simmer them for 30 minutes and then let them cool completely. 2. While the dates are cooling, measure the flour into a bowl and make a well in it. Measure in the yeast and pour over the 100 ml of water. Flick some flour over the water to close the well and let it sit until the dates are completely cool. 3. Add the salt and the dates and the rose or orange water and mix everything together. Turn it out onto the counter and knead well for 10 minutes. It is soft and sticky but don't add more flour, just cope with it! 4. Return it to the bowl and cover it. Let it rest for 1 hour. 5. Scrape out the dough again and divide it into 10 equal pieces. Shape them into buns (see a video here about how to do that) and put them on a baking tray that is covered in non stick baking parchment. Cover them with a tea towel and let them rest for 45 minutes. 6. Pre heat the oven to 220 degrees C. Brush the buns with the glaze and sprinkle them with sesame seeds. 7. Bake for 15-20 minutes. When they are done they will sound hollow if you tap their bottoms. Let them cool on a wire rack and then take them to your neighbours/friends/office colleagues who are suffering. A taste of home may make them feel better. You can also take them to airport to feed protesters. Banned Buns. The new way to protest. This recipe first appeared in The Book of Buns - a book of bread from around the world featuring various recipes for Banned Buns from, for example, Syria, Libya, and Iran. You can buy it on Amazon. Want to learn more? Click here to take a bread class with us. You will change the world in your own way. I think this is a brilliant idea and I'm looking forward to more Banned Buns recipes. I don't think we can afford to be silent in today's political climate. I'm German and Trump's promises and actions send shivers down my spine. Bless you for your piece on this monsterous act. This is a beautiful, humanitarian gesture. Love it so much I bought the book to share even more Banned Buns with more caring people.